Budget Range Poker Chips - Supplied in rolls of 25. Made from ABS composite material. Two colour construction - Pink with White suited accents & edge spots. Features Heart, Club, Diamond and Club suited design. Each chip has a Gold Foil printed number '200' on BOTH sides. Colour shade may vary from image shown. Some chips may be a bit rough around the edges may not lay perfectly flat. These Suited Numbered Poker Chips are a classic 2 colour construction ABS composite chip and weigh 11.5g. 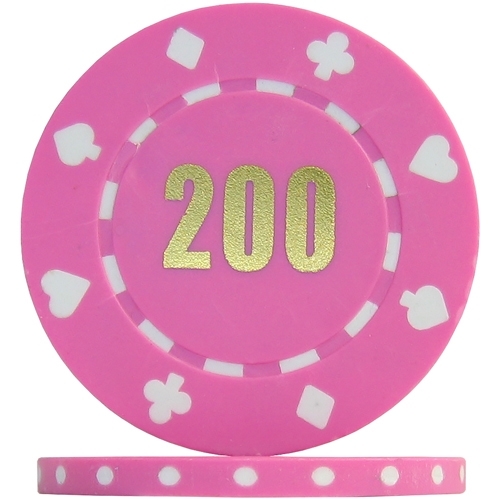 Each Pink chip comes with a gold foil number '200' printed on both sides defining its value. PLEASE NOTE: These are End of line Budget Range poker chips, thats why they are selling cheap. Some chips may may not be perfect, they may be a bit rough around the edges and not always perfectly flat, but they will do the job!! Available in single rolls of 25 poker chips and in various cased poker chip capacity. Cased sets include assorted Suited Numbered Poker Chips, dealer button, blind button pack and 2 cut cards, cases with card and dice locations also include 2 packs of 100% PVC poker sized playing cards and 5 red dice.